This photo comes from from Anne Krone who lived in 48 Somerset Street, Mosman in her early years. She is doing her family history on the Carmody and Macdonald families. In this image there is a group of 11 men. The man in the front row on the right is John Hugh MacDonald, his hat is on the seat and he was a cripple. The man in the back row second from left might be John Carmody although he died in 1926 and Anne thinks the photo is 1930s – 1940s. And the man in the middle row far right may be from the Minton family who were big in the Mosman Cricket Club. 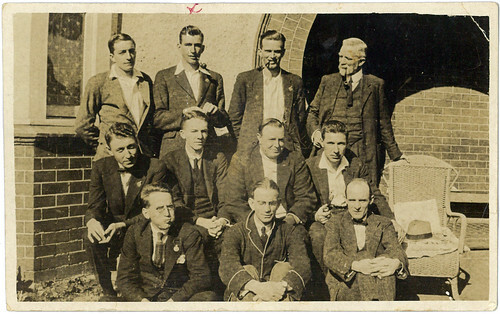 Another thought from a relative was that the photo shows a group of Mosman men belonging to a Mensa group in the 1930s or 1940s. Can you help us identify this photograph and these men? Is Anne Krone Barry Krone’s sister? I was at Mosman Primary with Barry in the 50’s and there was a girl called Anne Carmody whom I think he married. Am I right? I think Barry became an architect and lived in Bathurst for a while where my sister Susan Britton lived as she was married to the vet Blake Britton. Close examination shows that four of the men are wearing ‘returned from active service’ badges on their lapels, they are ex first AIF. Some of the others wearing cricket whites might also be ex-diggers. The 1920s seems more plausible date than the 1930s. I lived at No 10 Mandalong Road until 1957, my grandfather John Virtue (ex AIF) built a house at No 10 Awaba Street in the late 1920s, living there until 1959. After researching I believe this photo was taken after WW2 1945-1949 era.Three Carmody brothers and their brother in law were in WW2 and their father Henry top right hand back. Most were Air force, one Army and hence four returned service medals can be seen in photo. John H J Carmody lived until 1999. Their father died in 1950 so photo is before 1950 some time after WW2 ended. Douglas (Keith )Carmody was associated with Australian Services Cricket team after the war. All loved cricket and grew up in 319 Military Rd, Mosman. Keith was Pow Holland and Noel Pow in Changi in WW2. Carmody and possibly their father Henry D Carmody is holding the chair. The Family home was 319 Military Rd Mosman. Their father died 7/5/1950, the boys were discharged various dates 1945 & 1946 and all were associated players of Mosman Cricket club prior to WW2. The dress style and pipes date to mid 1940’s. The one on left back maybe brother in law Corporal William Bergstrom who lived in Mosman in 1949.